First appearance of this switch was on a conference call in February 2017. This switch may not exist. While it was submitted to OCP, there is no data sheet. Alpha Networks has a 2-year old switch based on the Trident2+ which, along with a gearbox ASIC, provided four 100 Gb/s uplink ports. 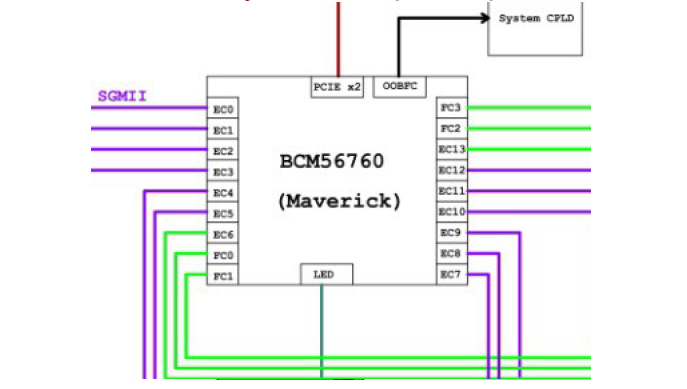 This is the follow-on to that switch, based on the Maverick ASIC. It has at least some SERDES capable of running at 25 Gb/s -- and hence the built-in 100 Gb/s ports. What we don't know is the number of switch cores and buffer memory per core. Details are in the OpenCompute Project submission. That submission says that the switch bandwidth is 880 Gb/s. That is less than the sum of the port speeds. Some of the details about this part may not be entirely correct. It is also listed as Maverick in the slide show presentation to OCP when four switches were submitted for standardization.